You are trying to identify when there is a transition from sellers to buyers (long) or from buyers to sellers (short). It is kind of like a football game. You are looking for those times on a stock chart where one side has the ball, gets tired, fumbles, and the other side gains possession. Or, you are looking for a violent change in direction - an interception. On this chart, we have two interceptions and one fumble (with cheesy little football icons!). Starting at the left side of the chart, ABAX was in a clear downtrend (not shown). The sellers had possession of the ball. Then there was a kicker candlestick pattern. This is the interception that changed the outlook of the game. Going to the second football (middle of the chart), you see four consecutive down days. The sellers have the ball. But, looking at the last two down days, you begin to see the tails forming on the candles. The sellers are gradually getting tired and the buyers are getting stronger. Then, all of a sudden, and "up day". This is an inverted hammer. Sellers have fumbled and buyers now have possession of the ball. Going to the last football, you see 5 consecutive down days. 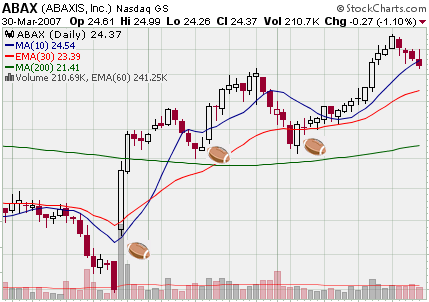 On the last down day, the stock closes at the very bottom of the range. Sellers have complete control over the stock. They are winning. Then, on the next day, there is a violent change of direction and a bullish engulfing pattern develops. An interception! So, if you think of trading as just a game of football, it may be easier for you to make better trading decisions. And you may score some more touchdowns. I am not a day trader. I would rather watch paint dry than stare at candles forming on a monitor. I don't know how they do it, but I have a lot of respect for them! Last week I was pretty confident that the market would move to the upside (the Semis were looking ready to rally). I ran a momentum scan and came across METH. Normally, I don't trade "momentum type" stocks like this, but the daily chart intrigued me. The last candle was trading over the range of the last three candles (the pullback). This stock was trading at multi-year highs. There was no resistance because (most) everyone involved in this stock now was profitable. There was no reason for them to sell. I thought, "This stock could very likely have an exhaustion move to the upside". Still, the tails that were developing on the candles suggested to me that this rally would probably not last much longer. Wow, look at that pennant chart pattern. Just beautiful. A pennant is a continuation pattern so I was pretty confident that there would be a breakout to the upside. So I thought, "If this stock breaks out, I'll buy it today and dump it tomorrow." Look at that! A nice basing pattern that looks poised to break out! I had remembered that Kevin Haggerty (from Trading Markets) had referred to this pattern as a "slim jim". What was really interesting about this pattern was the failed breakdowns. Every time this stock tried to break to the down side, buyers stepped in to bring it back into the base - a sign of strength. So, for over an hour, I painfully watched the candles forming on my monitor. I was afraid to pee for fear of missing out on the breakout. I think at one point I actually became hypnotized! I bought it at $15.26 on the candle with the black arrow with my stop right under the base (I thought it was breaking out). I figured this a very small risk on the 5 minuted chart, that would trigger the breakout on the hourly chart, that would trigger a move to new highs on the daily chart! I could feel my brain hemmoraging trying to remember what all the different time frames looked like! The stock did finally break out the next day but I wasn't able to watch the market (I know. I know. That is a pretty important criteria if you want to day trade!) I just moved my stock to break even where I eventually got stopped out. I have a lot more respect for day traders. It takes a unique type of person to learn to be successful at day trading - and actually enjoy it! I think I'll stick with swing trading! On StockCharts.com, you'll notice that some of the candles are colored differently. These candles are different because of the way they close and open in relation to the prior day. Black Candle: If the candle is filled in with black then the stock gapped up on the current day, fell, but closed higher than the previous days close. Hollow Red Candle: If the candle is red and hollow then the stock gapped down on the current day, rose, but didn't close above the previous days closing price. Yes. This was a carefully chosen example! But there is some significance in these candles if you think about what is actually happening on these days. Starting at the top far left of the chart (1) you can see a filled black candle. The stock gapped up and then close less than the open - a sign of weakness. Those that are long this stock are now getting nervous. If the stock moves much lower, these traders will likely sell. Going to the second arrow (2), you can see two hollow red candles. The first one gapped down but still had enough strength to close above the opening price (same with the second). Those that shorted the stock are now getting nervous. If this stock moves much higher, they will likely cover. Same analysis with the 3rd and 4th candles (the arrows on the chart). So are these strange looking candles worth paying attention to? Absolutely! I wouldn't rush to buy a stock or short a stock based on a filled black candle or a hollow red candle but I would definitely take note. At the very least, these candles are "momentum stoppers" that could result in a reversal. I came across this stock the other day and I just became fascinated with the price action in this stock. It also reminded me why I am such a big fan of candlestick charts. 1) This stock was in a nice uptrend until the big gap down with a wide range candle on massive volume. These types of moves are institutionally driven and often ignite new trends. 2) After a short two-day bounce, a bearish engulfing candle forms. Engulfing candles are my all time favorite candlestick pattern. While other candlestick patterns show a slowing of momentum, engulfing candles tell you for a fact that the other side has taken control of the stock. Of course this can change on the following day but at that point in time, you have confirmation that a reversal is taking place. Over the next several days, narrow range candles develop that stay near the bottom of that engulfing candle. This shows weakness on the part of the buyers. If they can't even move the stock very far into the prior days range, then you have to assume that sellers will take control of the stock again. And they did. 3) After a five day rally another engulfing candle forms. We know for a fact that sellers have completely overwhelmed the buyers. Those who bought into this rally are now questioning their decision. Fear creeps in and the stock tanks. 4) This stock first showed up on my scan with the doji at $22.00. I thought, "Hey this might be a great shorting opportunity." While a doji tells you that a slowing of momentum has occurred, it really doesn't signal a reversal in and of itself. It tells you that a reversal could happen. It didn't. So now we have an interesting rally. It started out innocent enough with just a couple of narrow range candles, but now it has expanded into a strong rally. Greed is beginning to set in as the daily ranges expand. This stock has retraced too much of the prior swing for me to consider shorting this stock now, but at the very least this stock will consolidate. It may reverse. Heck, maybe another engulfing candle will develop. So, while a regular old bar chart gives you the same information, a candlestick chart paints pictures of human emotions. That's why I love candlestick charts. As a discretionary trader, I need these pictures to make good trades! This is our new web site theme song, The Sultans of Swing by Dire Straits. This is a daily chart of DVA and I've embedded a 5 minute chart in the upper left corner. On the daily chart you can see the hammer and on the 5 minute chart you can see what happened to cause it. The daily chart was showing a sell-off and all of those traders that were holding long positions were definitely feeling the pain of it. Then, on the day of hammer, the stock sold off hard near the beginning of day (see the 5 minute chart). Those holding long positions gave up on the stock and sold. Short sellers began to establish positions thinking that the stock was headed even lower. But then the stock rallied all the way to the end of the day. Short sellers were forced to cover and those who sold during the morning sell-off were regretting their decision! Both sides were losers. The only stock traders that made any decent money are the small minority of traders that bought the stock right after the sell-off - when the stock looked the worst. My First Trip to Vegas: Got Any Tips? My wife and I are taking a trip to Las Vegas next month for her birthday. This will be my first ever trip to Sin City! I am not a gambler so I never really had a reason to go there. It just never interested me. But the misses wanted to go, so I thought what the heck. We will only be staying for a long weekend, so I obviously want to make the most of my time. Got any Vegas tips? What are the best shows to see? What are the best restaurants? Other than video poker machines, I haven't really played any other games in a casino. The only other gambling experience I have is a few Texas Hold'em tournaments with friends! If you got any Vegas tips and tricks for a newbie, I would greatly appreciate it! Thanks to Jack for pointing me to this post by Filtering Wall Street. Best Show: "O" by Cirque Du SolielIf you like cars, there's a Ferrari museum inside Steve Wynn Resort. Shopping is nice at Caesar Palace. Do check out Venetian's shopping area as well. Luxor's is must see ONLY from a architectural prospective. While you're at the Bellagio, do stop by their in-door garden area. Best Game: Try Texas Hold'em (since you've done it with your friends before.) There's a Poker Room at almost every casino these days. Hoover Dam is a must - rental a car for the day and go down there. Go to the top of the Stratosphere for the view of everything (at night is much better). Best buffet is at the Aladdin. Must see the light show at downtown Fremont Street (again at night). See the Lions at the MGM. If you like beautiful rock formations - rent a car and go to Red Rock Canyon and/or Valley of Fire. Every show I have gone to I have loved. Get the free booklets and magazines and find coupons to things - it can make the Comedy Clubs much cheaper - the type of show I love best. And every November - week before Thanksgiving they have one of the largest Stock conventions in the world. I try to go every year. walk the forum at caesear's palace. enjoy the biaggio and fountains. fremont experience is for nascar aficionados. the "high roller" and "big shot" are excellent for bar talk and fun too. Go to a show, tip the maitre d so you get a premium seat, you will want to ask the hotel concierge how best to handle it. but be sure to do it or you will see an excellent show from the wings and hey it's only money! front center please!!! Get slightly wiffed on their dime. Now a real day trader will have to play baccarat, I mean isn't there a little/lot of James Bond wannabes in all of us? And of course the beauty of Baccarat is you don't have to know or do a thing, you make no decisions after the bet, when you win you just give you best James B smile and if it goes against you a J/B condescending smirk will do. Is your tux pressed and ready? The stratosphere used to have a No Craps craps table where you didn't lose the bet on 1,2, or 12 come out but established the point there instead, rather different and fun, particularly if your favorite bet on your own come out roll is "any craps please" Take a look after becoming a "Big Shot" and "High Roller". So there you have it, all the perks in one place. and after all the excitement, the fun, the winning, the dining ,the shows, the incredible sites to take in, the boozing (moderation please) you can take the wonderful woman you love and reaffirm your commitment. WoW! Vegas covers it all, Enjoy!! "KEEP YOUR HANDS IN YOUR POCKETS!!"